فلاحی, احسان, اکبرپور, ابوالفضل, خطیبی نیا, محسن, ابراهیمی, حسین. (1394). طراحی شکل بهینه کول قنات با استفاده از روش اجزای محدود و الگوریتم جامعه پرندگان. نشریه آبیاری و زهکشی ایران, 9(4), 561-570. احسان فلاحی; ابوالفضل اکبرپور; محسن خطیبی نیا; حسین ابراهیمی. "طراحی شکل بهینه کول قنات با استفاده از روش اجزای محدود و الگوریتم جامعه پرندگان". نشریه آبیاری و زهکشی ایران, 9, 4, 1394, 561-570. فلاحی, احسان, اکبرپور, ابوالفضل, خطیبی نیا, محسن, ابراهیمی, حسین. (1394). 'طراحی شکل بهینه کول قنات با استفاده از روش اجزای محدود و الگوریتم جامعه پرندگان', نشریه آبیاری و زهکشی ایران, 9(4), pp. 561-570. فلاحی, احسان, اکبرپور, ابوالفضل, خطیبی نیا, محسن, ابراهیمی, حسین. طراحی شکل بهینه کول قنات با استفاده از روش اجزای محدود و الگوریتم جامعه پرندگان. نشریه آبیاری و زهکشی ایران, 1394; 9(4): 561-570. کاریزها یا قنات‌ها سازه­های آبی اختراع ایرانیان هستند که توسط آن­ها آب­های زیرزمینی استحصال شده با نیروی ثقل و از زیرزمین و دور از تبخیر منتقل میگردد. ساختمان کاریزهای ایجاد شده در ایران از حالت دائر به بائر تغییر وضیعت داده و برای جلوگیری از تخریب ساختمان کاریز از سازه­های مقاوم یا کول­ استفاده گردید. هدف اصلی از این مطالعه، طراحی شکل بهینه کول قنات با استفاده از روش اجزای محدود و الگوریتم جامعه پرندگان می‌باشد. برای این منظور، ابتدا مدل‌سازی سه بعدی کول و اجزای اطراف آن در نرم‌افزار ANSYS انجام شد و سپس شکل بهینه کول با استفاده از روش بهینه‌سازی الگوریتم جامعه پرندگان و الحاق آن به نرم­افزار ANSYS به­دست آورده شد. وزن کول به­عنوان تابع هدف مساله بهینه­سـازی و متغیرهای طراحـی شامل ‌پارامترهای هندسی کول ‌درنظر گرفتـه شد. هم­چنین تنش در بدنه کول (تنش­های فشاری و کششی بتن) به­عنوان محدودیت­ لحاظ گردید. نتایج بهینه­سازی بیانگر کارایی بالای الگوریتم جامعه پرندگان در طراحی بهینه شکل کول‌ بود به­طوری­که وزن بهینه کول در مقایسه با کول­ موجود کاهش قابل توجه­ای داشته است. Ghanats are water structures of Iranian invention. Groundwater extraction is transferred by Ghanat, with the force of gravity and from underground and away from the evaporation. Structure of Ghanats created in Iran was changed from the used state to unused state, and the resistant structures or Kaval were used in order to prevent the destruction of structure of Kariz. The aim of this study is the optimal shape design of Ghanat Kaval using finite element method and particle swarm optimization. For this purpose, first, 3D modelling of Kaval and it’s around element was implemented in ANSYS software. Then, optimal shape design of Kaval was achieved using particle swarm optimization and linking it to ANSYS software. Weight of Kaval was considered as the objective of optimization problem, and the geometry parameters of Kaval were design variables. Also, stress of the body Kaval (compressive and tension stresses) was considered as constraint. The optimum results were shown that particle swarm optimization had high performance in the optimal shape design of Kaval so that the weight of Kaval in comparison with the existent Kaval was considerably decreased. صدری،ک.، سلامی،ح. 1368. نقش سرمایه‌گذاری و لایروبی در کاهش تلفات آبدهی و حفاظت استان‌های فارس. مجله کشاورزی ایران. جلد 1 و 2، 55-72. مغربی،م.ف. 1389. بررسی گل آلوده‌سازی آب قنات بلده فردوس در انتقال به باغات و زمین‌های کشاورزی. طرح پژوهشی دانشگاه فردوسی مشهد. 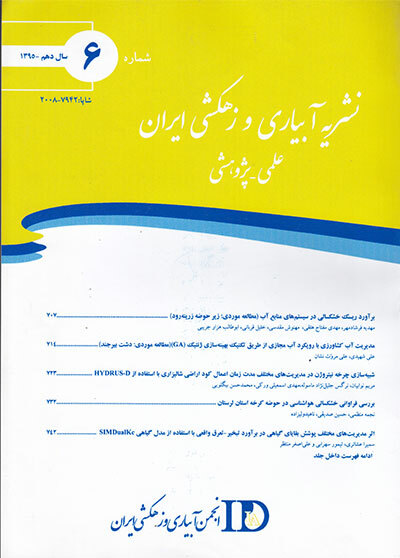 ایزدی،ت. ناظم‌السادات،ج. 1388. ویژگی فیزیکی آبدهی و بررسی امکان ذخیره‌سازی آب قنات کتک ارسنجان. مجله مهندسی آب. سال دوم. 21-30. ACI. 2008. Building Code Requirements for Structural Concrete (ACI 318-05) and Commentary. American Concrete Institute, Farmington Hills, Michigan. ANSYS Inc. Theory Reference. 2006. Release 10.0 Documentation for ANSYS, ANSYS Inc. Eberhart,R.C., Kennedy,J. 1995. A new optimizer using particles swarm theory. Proceedings of the Sixth International Symposium on Micro Machine and Human Science, Nagoya, Japan, 39–43. Khatibinia,M., Salajegheh,E., SalajeghehJ and Fadaee,M.J. 2012. Reliability–based design optimization of reinforced concrete structures including soil–structure interaction using a discrete gravitational search algorithm and a proposed metamodel. Engineering. Optimiz. 45: 1–19. Li,L.J., Huang,Z.B., Liu,F., Wu,Q.H. 2007. A heuristic particle swarm optimizer for optimization of pin connected structures. Comput. Struction. 85: 340–349. Shi,Y., Eberhart,R. 1998. A modified particle swarm optimizer. IEEE International Conference on Evolutionary Computation, IEEE Press, Piscataway, NJ, 69–73. Rajeev,S and Krishnamoorthy,C.S. 1992. Discrete optimization of structures using genetic algorithm. Journal of Structure. Engineering. ASCE. 118.5: 1233–1250. Salajegheh,E., Gholizadeh,S and Khatibinia,M. 2008. Optimal design of structures for earthquake loads by a hybrid RBF-BPSO method. Earthq. Engineering. Vibrat. 7, 14–24. Salajegheh,E., Salajegheh,J., Seyedpoor,S.M and Khatibinia,M. 2009. Optimal design of geometrically nonlinear space trusses using adaptive neuro-fuzzy inference system. Science. Iran. 6.5: 403–414.